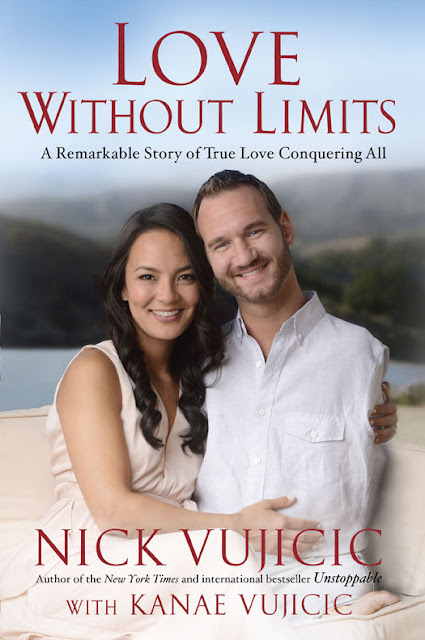 Nick Vujicic was born without arms and legs, and he often wondered if he would ever find a woman who would love him. God brought that woman into his life! In Love Without Limits Nick and Kanae share their story of meeting, falling in love, and the first two years of marriage. Love Without Limits is written primarily by Nick, but Kanae contributes as well. This book is written to those who are single, dating, engaged, or newlyweds. Nick and Kanae share advice from what they have learned about waiting for a spouse, dating, and the early years of marriage. I expected there to be more information about marriage with a disability in Love Without Limits. There were some specific stories and encouragement for marriages with a disabled spouse, but this book is written for anyone, whether healthy or disabled. The struggles and challenges that Nick and Kanae faced will be relatable to many. There are a few stories of ways that Nick’s disability has impacted their marriage, and I enjoyed reading about Kanae’s thoughtfulness and service to her husband through all of it. She loves to serve Nick, and she does not see it as a burden. When she can, she comes up with creative ways to help him experience something on his own. One way Kanae served Nick creatively was by wrapping a gift in such a way that he could open it on his own. It was the first time in his life that someone had wrapped a gift that he could open without arms and legs. Nick and Kanae share a lot of advice for single, dating, and engaged couples. But my favorite parts of the book were when they shared stories about their lives before meeting each other and their life together. This book includes many pictures that give a further glimpse into their marriage and family. Nick and Kanae certainly face challenges in their marriage, but their love for Jesus, and their love for each other, helps to keep their marriage strong. Disclosure: I received a complimentary copy of Love Without Limits through Blogging for Books in exchange for a review. All opinions are my own.